politicalbetting.com » Blog Archive » Is Guido going to get beaten in the hanging race? « Was going for a smaller House of Commons a mistake? Is Guido going to get beaten in the hanging race? Will either petition get to 100,000 by February? 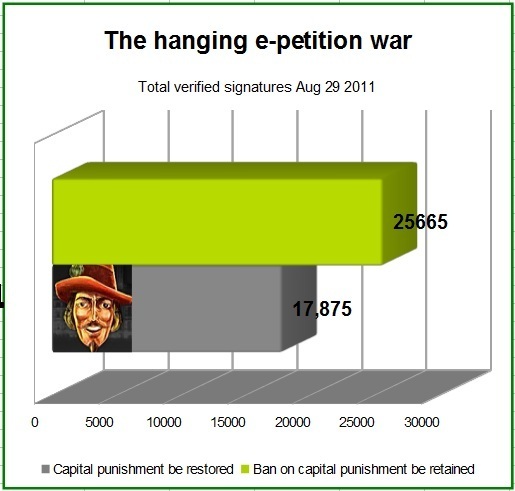 The chart features today’s update in the race between the two petitions on capital punishment – one sponsored by Paul Staines (aka Guido) calling for its restoration for specific categories of murder. The other petition, which was started on the same day is calling for the ban on capitial punishment to be retained. This afternoon’s totals were 17,875 for the restoration of capital punishment and 25,665 for those who want the ban to be retained. Both were posted on the official web-site on August 4th and both have received a fair bit of media attention. Once a petition reaches 100,000 verified “signatures” within six months then the issue becomes eligible for a Commons debate. Interestingly the difference between the two petitions, with the abolitionists maintaining a solid lead, is not mirrored in the polling. Almost all surveys show that most people want the death penalty to be restored. I’ve been surprised by the way this has developed – but there’s still five months left. Guido could still come out on top.